Two aging relics of World War II just won a battle against time last week. Congressman Anthony Weiner secured $2.4 million to restore a pair of disintegrating aircraft hangars at Floyd Bennett Field. Built in 1931, Floyd Bennett was the city's first municipal airport. And during World War II, its eight huge hangars housed Navy warplanes on their way to the front. Today, they remain the most popular historic attraction at Gateway. Over the years, the hangars have fallen into disrepair. In fact, hangars 3 and 4 are now used for little more than storage. But not for long. In this year's Department of the Interior Appropriations bill, Weiner secured $2,416,000 to repair the hangars, fix their roofs and restore their walls and windows. And when the repairs are completed, the hangar doors will be thrown open to the public with both buildings hosting historical exhibits and displays about the warplanes they sheltered during the Second World War. "This is another important step in ensuring that a treasured New York City landmark will remain a vibrant resource for Brooklyn long into the 21st century, " Weiner said. On December 17, 2003, the Task Force organized a Centennial of Flight field study trip and celebration at Floyd Bennett Field. 4th and 5th grade students from Brooklyn elementary schools PS 114 and PS 225 were given special tours of the Field, including airplanes under restoration in Hangar B.
Rep. Anthony D. Weiner (Brooklyn-Queens) attended and spoke to the children. The event included a color guard from the 6th Communications Battalion, United States Marine Corps; the dedication of a "Centennial of Flight Flag" by Congressman Weiner; and tours of the Ryan Center's control tower, its "secret passage" (a 1930s era tunnel from the control tower building out onto the tarmac) and historic Hangar B, on the shore of Jamaica Bay. Park Service rangers acted as tour guides and interpreters. The occasion marked the unveiling of a Teaching with Historic Places (TwHP) lesson plan researched and written by the Task Force. The lesson plan will serve as a teaching tool for elementary school teachers and students. The lesson plan's focus is WW2 naval aviation heritage of Floyd Bennett Field. The field study trip and lesson plan are key parts of the Task Force's strategy to promote public interpretation of Floyd Bennett Field's naval aviation heritage. 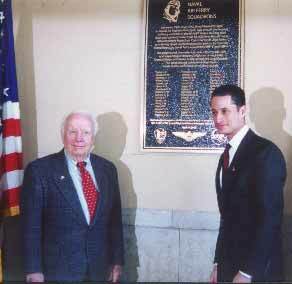 VRF-1/VRF-4 pilot Norbert Aubuchon (left) and Rep. Anthony Weiner with newly unveiled plaque. Congressman Anthony D. Weiner, NY-9th (Brooklyn- Queens) unveiled a large bronze plaque Saturday December 7, 2002 in the west lobby of the Ryan Visitor Center (control tower/administration building) Floyd Bennett Field. The plaque is dedicated to the World War II pilots of the Floyd Bennett-based Naval Air Ferry Command, and in particular, pilots who lost their lives while on duty (whose names are engraved on the plaque). Speakers included Congressman Weiner, Gateway NRA General Superintendent Marc Koenings, National Park Service Floyd Bennett Field site manager Pete McCarthy, and VRF-1 / VRF-4 pilot Norbert Aubuchon. Rich Postel, of the Floyd Bennett based Historic Aircraft Restoration Project (HARP) honored HARP volunteer Jim Burke, who was a young marine on duty at Pearl Harbor on December 7, 1941. VRF veterans privately funded the Naval Air Ferry Command plaque. Veterans, the Floyd Bennett Field Task Force, and National Park Service staff worked together on the plaque's design and content. Between 1942 and 1945, Floyd Bennett Field, as Naval Air Station New York, was one of the busiest military airfields in the United States. During that four-year period, more than 46,000 new aircraft were delivered here from East Coast factories and flown to training bases and embarkation points for transfer to the fleets by naval ferry squadrons VRF-1 and VRF-4. The urgency of the American war effort made safe and expeditious delivery of planes a necessity. Demanding conditions made accidents unavoidable. The pilots listed below lost their lives while in the performance of their duties. The image at the top of the plaque was made from a photo of a VRF-1 pilot in 1942. The images at the bottom of the plaque are (from left to right) the National Park Service shield, Naval aviator's wings, and VRF-1 squadron insignia. Smith-Cornell Impressions in Fremont, Ohio cast the plaque. Well, here we are moving into summer. As we walk the wide variety of trails at Gateway, we often encounter crumbling structures of concrete - some overgrown, some still standing stark against the beaches. For many, the first reaction to seeing these historic fragments is: "Why does the National Park Service allow these to remain?" But as one pauses, we realize they are a graphic reminder of a conflict that engaged every part of the world. We had a personal opportunity to reflect on this period during a recent final reunion of pilots who ferried newly built warplanes from Floyd Bennett Field to the West Coast during World War II. Tens of thousands of these planes fought in the great battles that culminated in the formal surrender of Japan on September 2, l945. As transforming as the overseas war experience was for millions of Americans, the period between 1941 and 1945 witnessed an amazing transformation of American society and business. Women and minorities moved in huge population shifts to the factories building the weapons of war. American business, with government incentives, completely transformed itself into a model of efficiency and productivity, with Rosie the Riveter and Wendy the Welder building a Liberty Ship in four days! By the end of the war, women comprised 35 percent of the work force, and the war industry had cranked out 85,000 tanks, 295,000 planes and 5,500 merchant ships. While the United States did not suffer the deprivations seen in Europe, there were shortages and a great effort to conserve. Among this effort was the Victory Garden campaign, a highly success initiative to grow one's food at home. At its peak, nearly 20,000,000 gardens were producing 40% of the United States' vegetables. Could the community gardens you see sprinkled throughout Gateway be kindred spirits of the Victory Gardens? Since September 11th we have seen a significant effort to increase security. At the time of Pearl Harbor the nation lacked any semblance of a civilian defense system. However, this soon changed, and by the end of January 1942, there were over 5 million Americans involved in civil defense programs, all coordinated by the Office of Civilian Defense, which was chaired by New York City Mayor Fiorello La Guardia. landed on the runways of Floyd Bennett Field. The "Angel of Deliverance," a massive, propeller driven aircraft now sitting next to Hangar B, played a key role in the Berlin airlift. Come see us - ponder the concrete and the Angel. And have a wonderful, safe summer! Just as September 11 colors thoughts today, December 7 filtered the thoughts of Americans in the 1940's. War had been raging in Europe and its conclusion, while obvious to us today, was none to sure. 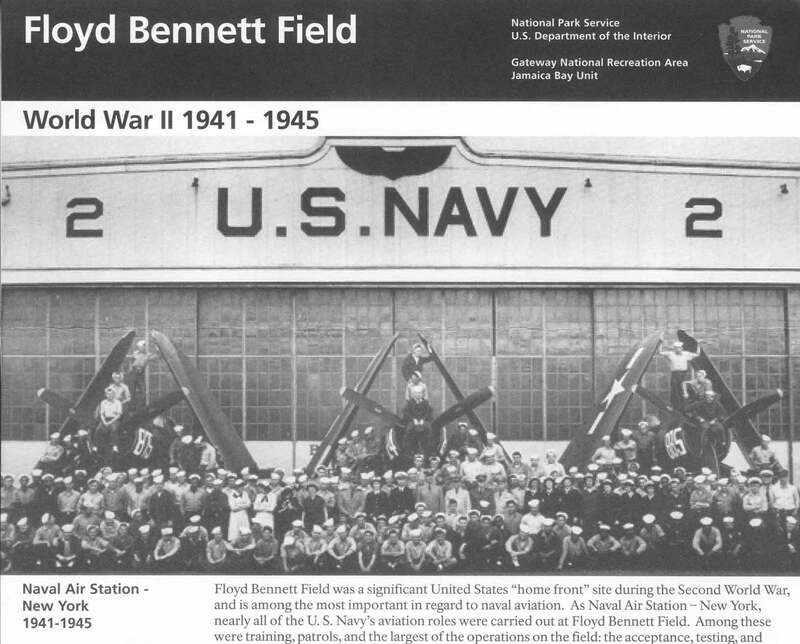 As part of the war effort, Floyd Bennett Field was designated to be the base of the first Naval Air Ferry Squadron, VRF-1. The biggest plants producing Naval aircraft on the East Coast were in Long Island, Connecticut, and New Jersey. These aircraft had to be flown to the West Coast for use in the Pacific. Floyd Bennett Field was so well located for the job that of the four ferry squadrons created across the country, VRF-1 and VRF-4 were both located here. Unlike VRF-1, whose pilots delivered all types of aircraft, VRF-4 was created solely to deliver seaplanes. VRF-1, part of the Naval Air Ferry Command, was established on December 1, 1943. Its mission was to rush planes from the factory to the fleet. A ferry pilot needed to be able to fly as many different types of planes as possible often with very little training. Since there was no room for training on Floyd Bennett Field's busy runways, training was moved to the Naval Air Station at Willow Grove, Pennsylvania. Even with limited training, the squadron performed brilliantly and did so with an excellent safety record. After the urgently needed planes were raced to the West Coast, pilots had to dash back to Floyd Bennett Field as quickly as possible. They accomplished this by obtaining Class II priority for travel. Class II priority allowed the pilots to immediately get on a train, plane, or military transport, bumping-off other passengers who did not have priority. At the time the running joke in the squadron was that only Mrs. Eleanor Roosevelt had a higher travel priority! The need for this type of priority can be easily seen when looking at the amounts of desperately needed aircraft the squadron was delivering. Over 1,000 planes were delivered each month, with close to 2,000 not being unusual. Not only did the squadron deliver new planes, they brought "battle weary" aircraft to air stations all over the country for maintenance. Without the ability to return quickly to Floyd Bennett Field to pick up more planes, a backlog of much needed aircraft would have quickly occurred. Between December 1943 and November 1945, the four ferry squadrons delivered 75,000 aircraft. Of these, VRF-1 delivered 46,000. At the end of the war, planes were still being transported by VRF-1. However, instead of flying mostly new planes, their main job was to bring used aircraft in for storage or overhaul. After the war VRF-1 was downsized, and in September 1946 the squadron was transferred from Floyd Bennett to Norfolk, Virginia. Like so many others who contributed to the war effort in non-combat roles, the men of the VRF-1 Squadron performed a valuable service that made possible the many battles fought to protect our nation. These heroes of World War II did not get the headlines or the glory of the pilots in the fighter squadrons, but their efforts will not be forgotten. In April 2002, the National Park Service hosted the final reunion of the veterans of the VRF-1 Squadron. Assembling for the last time at Floyd Bennett Field, these legendary flyers animated the now quiet runways and hangars of the former Naval Air Station. When asked to sum-up their feelings on their wartime contributions, many shrugged-off the accolades by insisting that "we were just proud to be doing our job." On June 6, 2002, the Task Force hosted a group of New York veterans and public officials as guests to a special event aboard the USS Intrepid Sea-Air-Space Museum in New York. The event was a "call to action" to veterans from all wars, and civilians who supported them on the home front to participate in the Library of Congress' Veterans History Project. The National Park Service, Rep. Anthony D. Weiner D-NY, and the Floyd Bennett Field Task Force hosted a tribute to WW2 Navy ferry pilots at their final reunion on April 29, 2002. A bus tour of the Field was followed by a luncheon in the Ryan Visitor Center, and a ceremony and reception in historic seaplane Hangar B (hosted by the Historic Aircraft Restoration Project HARP). New York Assemblywomen Audrey I. Pheffer, 23rd District Queens, presented a New York Assembly resolution and addressed the luncheon. At the ceremony, a representative of Queens Borough President Helen Marshall presented a borough resolution. Rep. Weiner, US Dept of Veterans Affairs official John J. Donnellan, Jr., and Gateway NRA General Superintendent Marc A. Koenings honored the veterans, followed by remarks from VRF-1 Association president Joe O'Brien. Awards recognizing dedication to the preservation of aviation history were presented to former Gateway NRA General Superintendent Kevin C. Buckley, HARP Executive Officer Richard D. Postel and Task Force founder and co-chair Richard K. Reed. 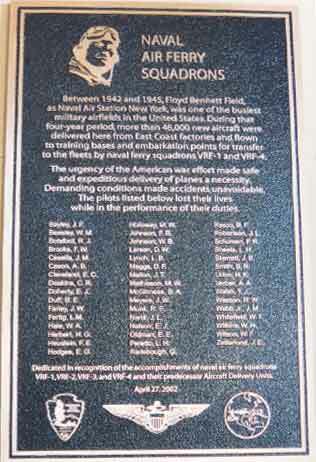 A plaque honoring Floyd Bennett based WWII naval air ferry squadrons - including those pilots who lost their lives while on duty - was dedicated. It will be placed in the Ryan Visitor Center. Special thanks to park staff and HARP volunteers - especially HARP's Marty Malone - for their help in making this a successful tribute.